Voltas opened up a Brand Shop in Lucknow, Uttar Pradesh. Located near Kapoorthala at Mahanagar Extension, Lucknow, the brand shop will feature the entire cooling appliances product range by Voltas Ltd including the newly launched ‘All Weather ACs’ as the star attraction. The Voltas Brand Shop aims to enhance the shopping experience of today’s sophisticated market, and would serve as a one-stop-shop offering complete comfort solutions to the populace of Lucknow. In its consistent efforts to produce technologically advanced and energy efficient air-conditioners, Voltas aims to meet the expectations of consumers in tier II-III markets. The store inaugurated by Mr. Pradeep Bakshi, COO, UPBG, Voltas Limited, stands out with its distinct location advantage with a commitment to increase customer reach, accessibility and offer consumers with the best in class shopping experience. 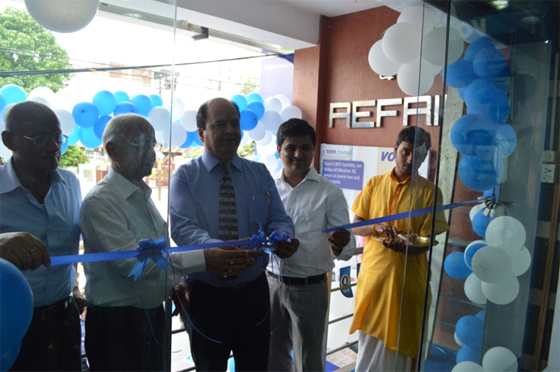 At the inauguration of its Brand Shop in Lucknow, Mr. Pradeep Bakshi, Chief Operating Officer, UPBG, Voltas Limited said, "We are delighted to inaugurate yet another Voltas brand shop in Lucknow. The brand continues to hold the highest Volume Market Share with 20.9% in June 2013 at an All India level. The brand also holds the No 1 ranking in the overall state of UP, which accounts for more than 19% of the market. The new brand shop in Lucknow aims to consolidate our leadership position in the market." Voltas' extensive range of Air Conditioners for 2013 available at the brand shop was introduced keeping in mind the varied requirements of consumers' with their diversity of priorities, weather conditions, income groups and aesthetic tastes.